Styled with colleta shirt and terre skirt . See this in Plaid, Alpaca-Wool or Virgin Wool. I ordered this coat for an upcoming trip to London. I was unable to find it in store because the coats had been sent back to the warehouse already. The coat is beautiful but on the left sleeve there is a black stain which after further inspection is actually a snag- I can see there is a small hole. After paying so much for the coat I am disappointed that it is damaged and now I’m unable to return or exchange it because my trip is this week and the coat is no longer in store. This was my second coat in another colour. I love that it is warm and wind proof. it is good for different occasions. the quality of the coat was the most attractive point for me. I got this in gold camel and Im obsessed! I don't like feeling the cold/wind on the nape of my neck but this style is so perfect cause it blocks it. However, this is not a coat you should wear in a real Canadian winter where you're outside for a long time - I usually just wear it when its no more than -15C outside. Other than that, this coat is very chic! Fully lined, warm and comfortable. Deep pockets also good for storing phone. Get lots of compliments on shape and color. Will be buying another in more colors. I love this jacket. The wool-cashmere fabric is luscious, the lines are wonderful, and it’s going to be a go-to item in my closet. Warm and cozy. Fits great! Beautiful colour in light grey. The jacket is great. I tried it on in stores and it fit slightly bigger than anticipated so I ended up going down a size and the fit was perfect. 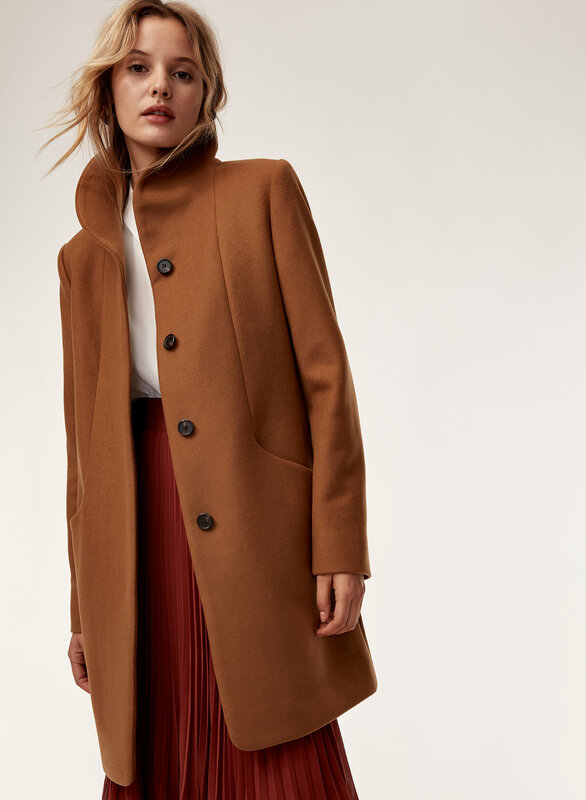 It really is a beautiful style coat but the color (which I no longer see available on website) is a little duller than pictured. I normally wear a M/L and was just swimming in the L as well. The collar also “creases and crumple” so doesn’t look as sharp. Kept the coat longer than I should have hoping to fall in love with it. 1st time buyer and with all the other nice styles available on site, should have exchanged or returned for merchandise credit. I purchased the cocoon coat in the mauvey-pink colour, "heather petale", online. Love the colour, but should be noted that there is a definite "heather" aspect to the colour - there is a bit of a dusty/flecked gray to it compared to one straight colour. Overall, I really do enjoy the coat and have received compliments on it from friends, family, and strangers. However, the one issue I have with the coat is with the lining. The description online says the lining is made with 100% cupro, however, on the tag of the coat I received, the lining is made with 100% polyester - I don't think it's right for Aritizia to be misleading its customers in this way. Even if this is an oversight, Aritizia is a large enough public company that should have processes in place to ensure that changes to their coats are reflected online, especially given the fact that online shopping likely represents a significant portion of Aritzia's sales and also given Aritizia's rather restrictive return/exchange policy for sale items, their online description should be accurate. 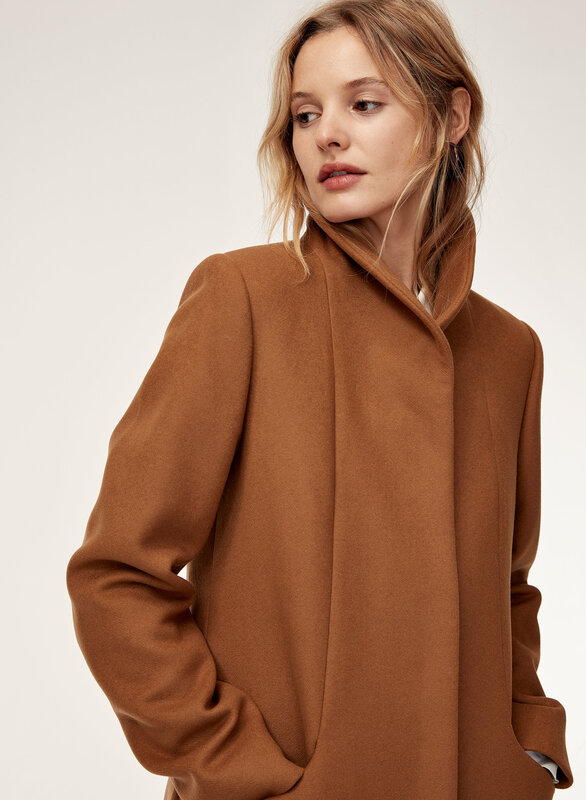 Cupro lining is actually used in another wool coat I purchased from Aritizia a few years ago, and there is a noticeable difference in the quality and feel between the polyester and cupro linings. 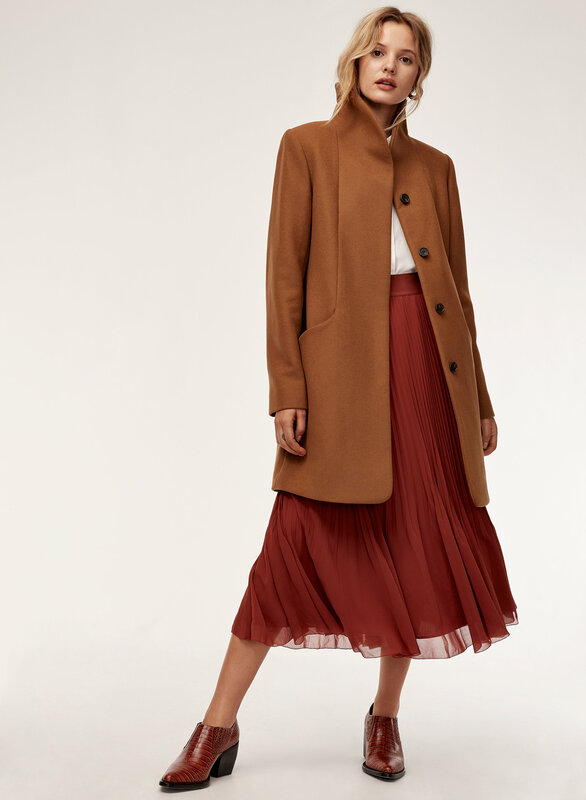 The polyester in this coat is less breathable, feels less luxurious and less silky/smooth, does not drape as nicely, and definitely feels cheaper and more "plasticky". Another difference is that the pocket interiors on my older Aritizia wool coat is lined on both sides of the interior, while the pocket interiors in this coat is only lined on one side - not a big deal but just an example of the small details that used to make Aritzia coats so great but which are slowly fading away. In summary, the polyester lining and decreasing quality of the lining and details is minus 1 stars. The other 1 star is taken away because of the misleading lining description of this coat online versus what is actually used. I love the cut, shape, material and even the color but it's slightly larger it's not true to size so you need to go down a size or two maybe. The fabric & cut are both so nice. I love my coat,I have recently bought and I am getting so many compliments.Its perfect for style and elegance. Love thr Wilfred Cocoon coat. The light grey is a lovely shift from the darker winter shades. Great dedign, love it! Love the Jacket ... it fits perfectly. love the material and fit of the coat, it's very flattering - 5 star there. however, i don't understand why the tag on the left sleeve is not sewn in with a basting/tacking stitch, the tag was meant to be removed. i now have 8 small holes on the sleeve and a tag indentation on cashmere coat, not happy and not impressed. check this before you buy. Slightly larger than expected but still love it and will get it tailored to suit me! I got an XS in the white one that looks grey and I’ve got so many compliments. I’m short and it looks perfect for my size I’m 5’2. Also you can dress it up or down super easily. Super classy and must have! This coat is perfect for wearing to work on chilly days. Keeps me warm and chic looking. The neutral colour palette also makes it timeless. You can wear it open with a beautiful scarf or close it up on those extra chilly days. I absolutely love this - warm and cozy and I get a lot of compliments. The ONE thing I’m not too fond of however, is how it wrinkles easily while wearing. The arms seem to bunch up a lot when I move around but other than that, this coat is lovely! So happy I bought this coat! It fit a little tight in the arms and shoulders so I went with a medium when I usually wear small in Wilfred. It is so warm but still feels light on. Such a great purchase. I bought the Nuance colour and have received compliments on it. Usually, I was not sure of the size as the fit varies depending on the type of clothing you order. In this case I ordered a size small and it was perfect even pairing with a sweater underneath. I usually wear a XS or S with Aritzia. This coat can be worn for a dressier occasion or casual. Haven’t really worn it enough to know about quality, but love the look and colour of the coat. Very timeless and classy. True to size. Does attract a fair bit of pet hair/woolies unfortunately. I love this coat! I coveted it all season then finally made a random colour choice and bought one online, and I am so pleased. Not sure I've ever had so many compliments wearing a particular article of clothing. Honestly obsessed with this jacket, it is just so beautiful. Jacket is super soft, lightweight, and warm. Only complaint is that the fabric tag is sewn onto the outer wrist of the sleeve. When it is removed, the holes are visible. I purchased this coat in December 2017 and wore it last winter and am wearing it again this winter so the coat is not new, however given the number of reviews stating that people think the coat will last a long time I felt that this review was waranted. It is a warm coat and I have no complaints there, however it pills terribly wherever the coat rubs and along many of the seams. As other reviewers have also commented the collar does not remain vertical over time, however my biggest complaint has been with the coat's lining. Even when new I could see that the seams of the lining were not well constructed (the stitches are loose and the needle used was too large leaving small holes around the threads) this has resulted in a number of large tears down the coat's vertical seams and in the pockets (I weigh 115 lbs. and the coat is not snug on me) the lining has also worn completely through leaving holes in several places. Only downfall was when I removed the tag on the sleeve it left four little holes and I was careful removing them. Other than that I love the coat! I fall in love with this Cocoon Coat since the first time I saw on window display and when I tried on, it looks gorgeous with the style. It keeps you warm and you don’t need to put any layer during winter. I bought 2 colours; Myth and Dark Chacoal. I’ve wanted this for a while now and picked it up! The silhouette is very feminine and I love the little details like the reenforced buttons! Great jacket that is warm for a wool jacket! Very happy with the coat. Flattering fit, receive a lot of compliments when I wear it. Wish it was a bit warmer but definitely happy with my purchase! This coat is so lovely! I bought it in the cigar colour and I really love it. It is quite warm and soft and looks very classy. I have been looking for the perfect winter dress coat and am so glad I waited for this one. She has broad shoulders for her size so the shoulders are a little tight but everything else is perfect. Obviously, she won't be playing tennis in the coat. Coat fits true to size. Length and color is great. The collar stands a bit too high for me and could be a bit shorter at the front by the face. I found the texture of the material not as soft as I thought it would be. Lot of threads and ?loose material I had to pick off before I used it.The buttons are a little hard to manage, looks a bit bulky when you sit. Using a zipper might have been easier to manage for my stiff hands. Love the pockets. Would buy another coat like this if cost went down. 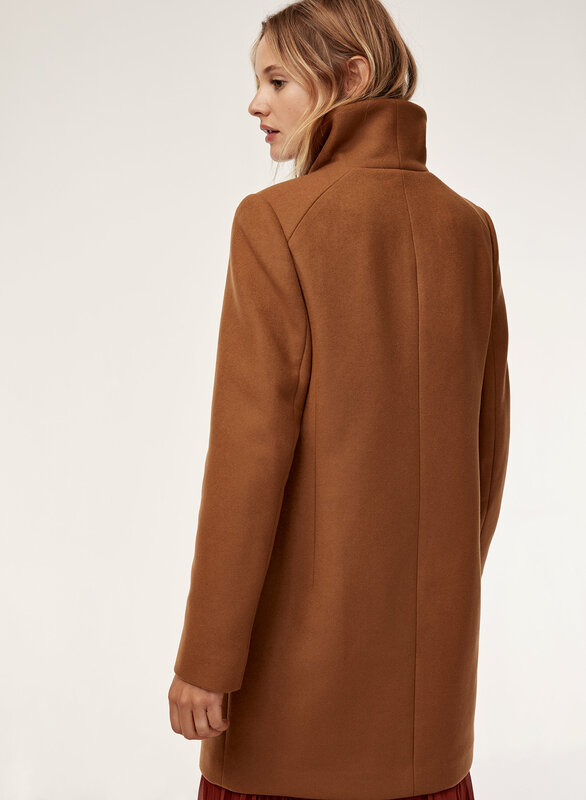 I shop at Aritzia mainly for the coats/jackets b/c you get what you pay for (QUALITY!). The cocoon coat is PERFECT for me and my height. I'm 5'0 and this coat doesn't make me look like i'm drowning in a robe. It's a timeless staple in my closet now. I am confused about the patch on the arm. I read reviews saying that if you take it off there will be little holes - which I really don't want. If Aritzia could clarify this? Cut doesn’t seem structures enough at the bottom. Not super impressed with this coat. The fabric is a bit sloppy. I may have to return or size down. 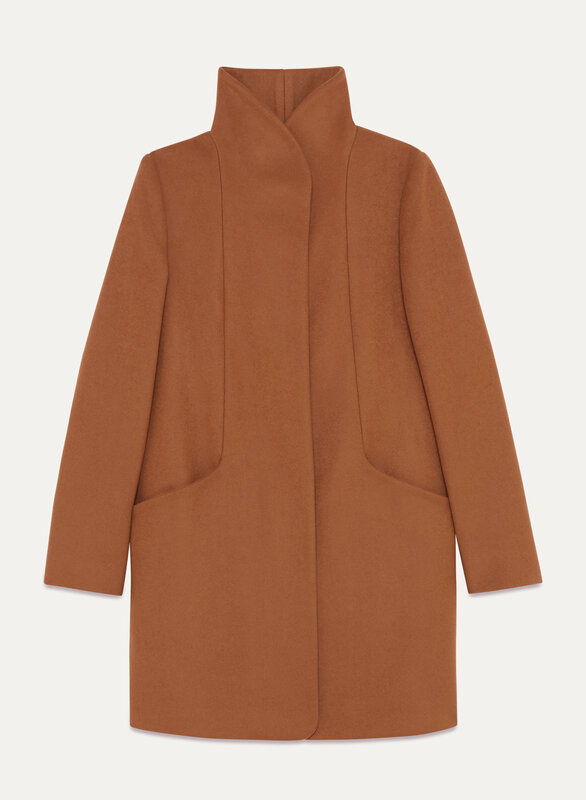 I bought the cocoon coat in Chasm (the perfect camel colour). I would have given this 5 stars but I've only worn my coat a few times for short periods and see a bit of piling on the underside of the arms already. Gorgeous coat. Warm, classic and timeless peice. Very happy with my purchase except that they sew a tag on the sleeve which leaves holes in the sleeve after removal. Other than that - beautiful coat!!! It came as a shock to me that my new $400+ dollar coat arrived to me with a giant hole in the pocket. The seem was completely split on one side and I can completely poke my hand through the full hole in the pocket. NOT up to the high standard that Aritzia prides themselves on. From a VERY disappointed customer.